TODAY: “The Outsiders” Final Performance! S. E. Hinton’s legendary novel is coming to the NEO Fine Arts stage. See it like never before. Tickets are FREE for NEO Students & Employees. $10 for adults, $5 eighteen & under. There is a special showing for area middle and high school students on November 30th at 10am. Students are $5 each. Educators, drivers, and chaperones are FREE! Please RSVP by email, pay at the box office. Thank You! The Outsiders is an international bestseller, the inspiration for a beloved movie and this heroic play of friendship and belonging. The NEO Theatre Experience is proud to announce the cast and crew for, “The Outsiders.” Thank You to everyone who auditioned. 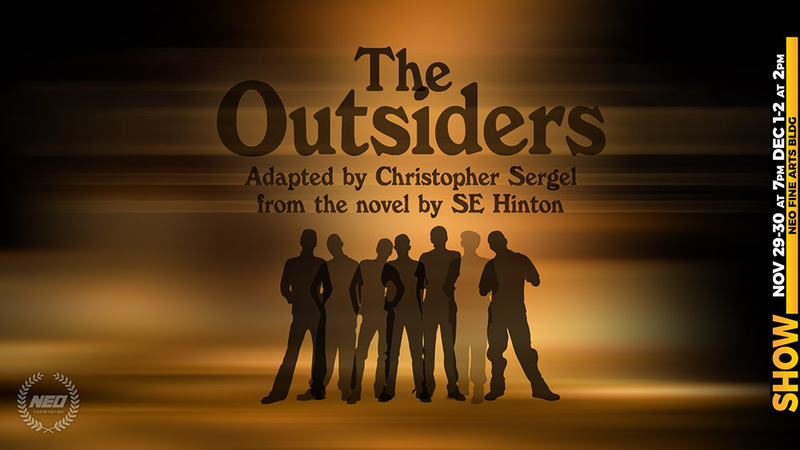 The Outsiders, adapted from S. E. Hinton’s novel by Christopher Sergel.